OpinionSquare Reviews - Legit or Scam? OpinionSquare Reviews – Legit or Scam? OpinionSquare, found online at OpinionSquare.com, claims to be a leading online market research company, with a research panel totaling over 2 million, the largest panel of its kind. OpinionSquare has clients in the both business world and media organizations, and helps them understand how people view and interact with online and television content by collecting information about trends and patterns created by average internet users. Once you become an OpinionSquare member, you will also be given the chance to participate in surveys on topics such as financial services, travel, health care, automotive, retail, and other industries. To participate in OpinionSquare, you must download and install their software on your computer. This software will not make your computer susceptible to a virus or spyware; rather it simply records and tracks your daily internet usage. Your personal and private information will not be recorded, and your information will not be shared or sold to anyone for advertising or marketing purposes. The software will only record the way you use the internet on a daily basis, and this information will then be given to their partner companies. OpinionSquare also requires that you give consent for them to contact your television service provider, so they can collect information about the programs and channels that you watch and record, as well as the on demand programming you order. OpinionSquare will not pay anyone directly for participating with their panel. After you install their software and become an active member, you will earn one entry into the monthly $100,000 Sweepstakes. For every friend or family member that you successfully refer to also join OpinionSquare, you will receive an additional sweepstakes entry. Each month they offer a sweepstakes where one member will win $100, as well as the chance to enter larger sweepstakes for $2500, $5000, or even $100,000. 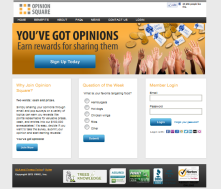 OpinionSquare will also occasionally provide you with special surveys that will also give you the chance to win gift cards and other rewards. Average Rating for " OpinionSquare " is 1 out of 5 based on 1 reviews. Scam! Viruses and malware! Stay far, far away!! !